All brake pads are not created equal. The type of brake pad that will perform best on your vehicle depends on the type of vehicle you are driving, and the type of driving you are doing as well as the performance you expect. Our brake experts can help you find the brake pad and parts that are right for your driving situation. From drum brakes to disc brakes, calipers and rotors, to shoes and pads, our technicians know your brake system and can perform brake inspections and brake pad replacements on almost every make and model. This includes models equipped with ABS, otherwise known as an Anti-Lock Braking System. With valid coupon. Check below for current offers and promotions. 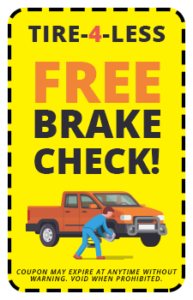 Always remember to have your brakes inspected every 12,000 miles or about once a year. A Tire 4 Less technician will conduct an inspection of the brake system’s linings and other key components and provide you with a written evaluation, including a detailed diagnosis of the findings. Service recommendations will be based on your vehicle manufacturer’s recommendations and the condition of the brake components that impact system performance. If your brakes require service, you’ve come to the right place. Our expert service technicians make sure that your brakes are serviced in accordance with your vehicle manufacturer’s recommendations, including all replacement parts like pads, hardware and if necessary drums and/or rotors. Our expert service technicians can can tell you whether a brake fluid exchange is due for your vehicle, based on your vehicle manufacturer’s recommendations. If it is, the technician will remove the old fluid and replace it with new fluid that will either match or exceed your vehicle manufacturer’s recommendations.